Ms Darcy arrives to offer her assistance to RR as they often enter chalk art competitions together as a team. Yet, with no apparent competition, RR declines any help from Ms. Darcy. A decision that later proves to be a fatal mistake. Is the RR Anderson - Ms. Darcy Team Invincible? As some may know, the Anderson couple regularly compete in chalk competitions. 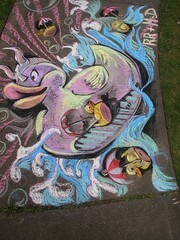 Senior creative field-team, RR Anderson & Ms. Darcy, return to Tacoma in triumph having won first-place for the Lake Stevens Aquafest "Chalk It Up" sidewalk art competition. This is the married couple's second, non-consecutive first-place victory in that competition. "We know they frown upon giving first place to the same people year after year" Admits Anderson, "That's why we plan to compete in Chalk It Up every other year." Slapping her chalk smudged thighs Ms. Darcy agrees: "I believe my husband and I are so extraordinary in the field of sidewalk chalking that it can hardly be called a competition when we sign up." "God Darcy, at least pretend to be humble about our unparalleled talents!" retorts Anderson, "You wanna get us killed?" The couple will split their $250 dollar winnings... Ms. Darcy will buy back to school clothes, Anderson will buy tools. A custom commissioned blown glass trophy celebrating the victor from Hilltop Artists in Residence designed by the Chalk Off victor. See the extensive discussion in prize announcement. Photo by Todd Matthews from the Tacoma Daily Index. Disclosure: this prize was exclusively arranged by RR Anderson. I know nothing more about it than his comment on an earlier post and Hathaway's website. RR Anderson's win last week in Episode VII with "Hathaway" apparently encouraged John Hathaway to contact RR Anderson and offer to be a sponsor. In recognition of R.R. Anderson’s and Laura Hanan’s efforts to clean up a panhandlers park and bring art to the citizens of Tacoma The New Takhoman offers the following prize to the winner of the 8th Frost Park Chalkoff. A fedora that began its provenance on the head of an extra in the 1930’s movie Little Caesar starring James Cagney. The wonderful chapeau then sat in the wardrobe department of a Hollywood studio until being drug out to adorn the head of an extra in the 2002 Paul Newman, Tom Hanks blockbuster movie “The Road to Perdition”. Subsequently purchased by The New Takhoman, the fur felt fedora covered the bald spot of the 39th and Yakima Lincoln Lanes pugnacious bartender Hathaway. 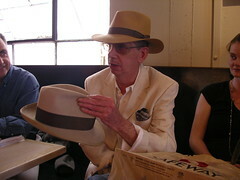 The hat Hathaway wore to his interview with Todd Mathews from the Business Examiner when he was foolish enough to consider bringing an honest person to the folds of the Tacoma City Council. This prize fedora is identified with the marking “VSH 1015”, which we were told by the studio purchased from, stands for Vincent Salerno Hathaway. Prize winner, wear it with pride, style and grace. For remember the wearer of this fedora begins their first step on that “Road to Perdition”. And never forget, its entire hatband is encased with the sweat of our brow as we appreciate the sweat of yours. Gentle reader: I cannot begin to describe John Hathaway or his role in Tacoma. There is too much complexity, depth and history for me to even try. Suffice as to say he knows a great deal of the underside of Tacoma and is regarded as one of the most controversial figures in the city. Hathaway's signature clothing piece is universally recognized as his prized Fedora which he is offering to the victor of Chalk Off Episode VIII. If you want to learn more about Hathaway, try googling his name. Ask a long time resident about him and observe their reaction. Suffice to say that the history, grit, and darkness go as deep as you dare look. No one knows more about Tacoma’s secrets than John Hathaway, a bartender at Lincoln Lanes, a neighborhood bowling alley. He’s part Phillip Marlowe, part Raymond Chandler when he’s not tending to his customers. And when Hathaway gets whiff of a story, he publishes it on his Web site, “The New Takhoman,” which is dedicated to getting under the skin of Tacoma’s power brokers. One comment about the city power washing the cement: although it is sad to see pieces be cleaned off before their time, it does actually greatly help the event by freeing up more panels for weekly contests especially as the rain becomes less frequent. Looking forward to seeing a picture of the Frost Park victor this week wearing the Fedora with the commissioned glass trophy. Not a typical Tacoma art function. by Dave L. on 5/29/2008 @ 9:19am I have never been a hat-person, but I there just no longer exists a decent haberdasher in downtown Tacoma. While this example offered by Hathaway is post [Red] Kellys, its quality, provenance, and Tacomaness still makes it a fine complement to prize #1 offered by Kathy and the Hilltop Artists in Residence. Please post hat-size. by Erik on 5/29/2008 @ 10:44am ...its quality, provenance, and Tacomaness still makes it a fine complement to prize #1 offered by Kathy and the Hilltop Artists in Residence. Please post hat-size. Who knows. It might give you special investigative powers. fedora is size 7 and a Half . You can win this relic of Tacoma's colorful history. by Erik on 5/29/2008 @ 1:54pm I was at Blackwater Cafe today with Andrew Fry. RR Anderson is the keeper of Hathaway's Fedora for the victor of tomorrow's chalk off Episode VIII. I asked RR to pose for this one in the classic Hathaway shot. by Elle on 5/29/2008 @ 8:46pm This would explain the brood of you at the market this afternoon. Guess you'll have to count me out on the prize this week my friends. Not prepared, have child (not that it has stopped me in the past) and in serious need of eating a real lunch on a Friday. I do believe we may stop by to do some cheering on though. by NineInchNachos on 5/29/2008 @ 8:55pm we'll miss you Comrade Elle!